Climate change is problematic for city planners and engineers. Twenty of the hottest years on record have occurred since 1995, indicating a steady pattern of increasingly warm temperatures. Dense urban areas are especially vulnerable to the impact of rising temperatures due to the heat island effect. 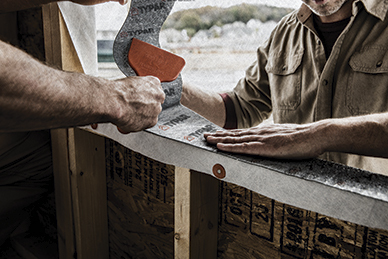 The Department of Energy (DOE) recognizes the employment of cool roofing strategies to combat urban heat islands and reduce the use of air-conditioning systems. According to the U.S. Environmental Protection Agency (EPA), cities with a highly built-up infrastructure can trap heat, causing temperatures to be at least five degrees warmer than in nearby, less-populated areas. Dark, non-reflective roof systems contribute to the urban heat island effect, with rooftops reaching 65.5 C (150 F) or higher in the hot summer sun. This heat can then transfer into the building, leaving non-air-conditioned portions of the structure with higher temperatures threatening the health and safety of occupants. For example, Chicago saw detrimental effects during the 1995 heat wave that caused the death of nearly 740 people. 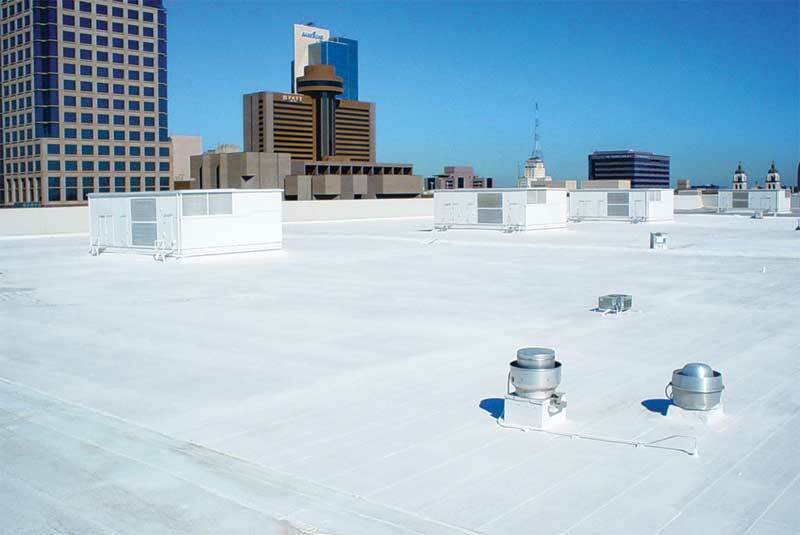 White, reflective roofs can decrease rooftop temperatures by more than 10 C (50 F), thereby reducing the overall heat that can potentially transfer into the building and improving the safety of building occupants. A previously dark roof covered with ethylene propylene diene monomer (EPDM) has been coated to reduce the heat island effect, thereby saving energy for the building. Transforming rooftops is not always an easy task for city officials and building owners. 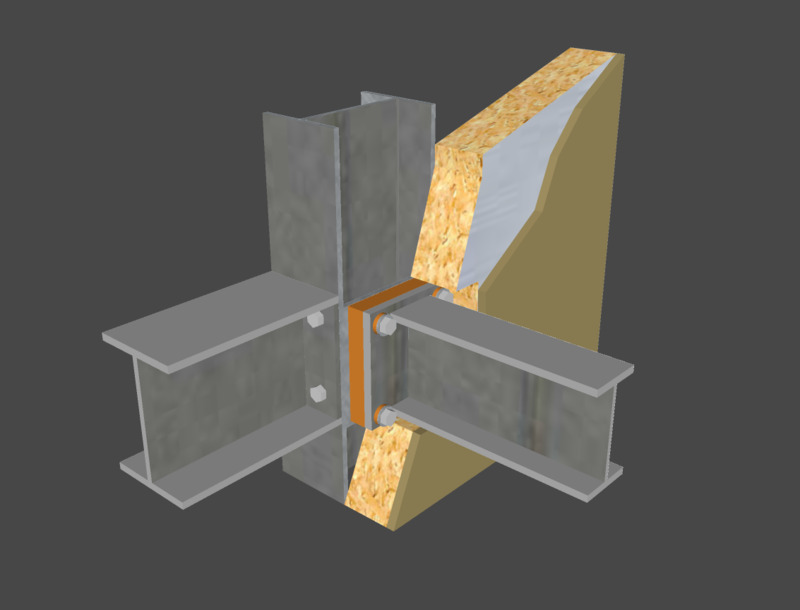 Transporting existing roof tear-offs down and new materials up several floors can be logistically challenging. 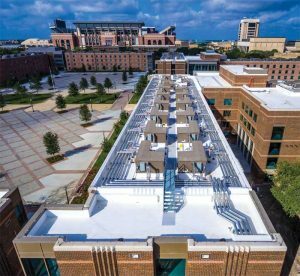 Roof coatings offer building owners easily transportable, innovative, and sustainable solutions to combat urban heat islands. Additionally, roof coatings with low-odor properties can offer installation benefits, including the reduction or elimination of building downtime. 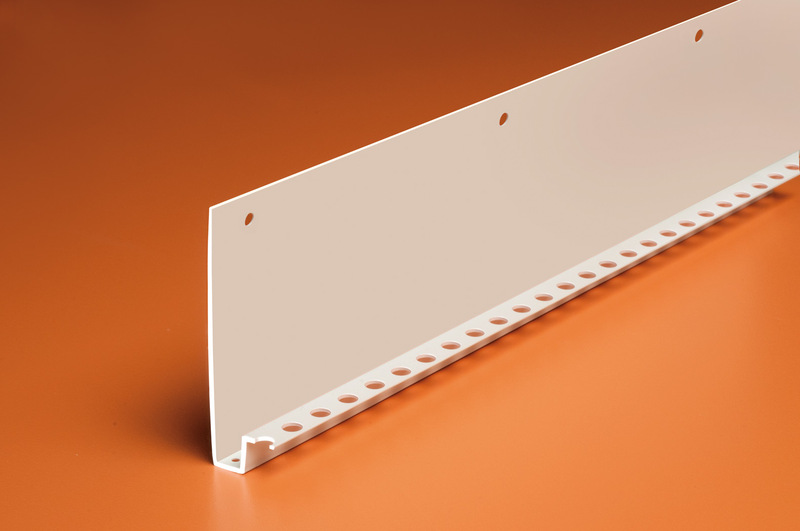 Incorporating various technologies like acrylics (known for their reflective water-based qualities), polyvinylidene fluoride (PVDF)—popular for color fastness—and silicones (preferred for providing protection against ponding water), roof coatings can be specified to meet critical performance attributes while offering unique design capabilities. retrofits are expensive and logistically difficult to execute when all the HVAC systems, roof insulation, and entire exteriors need to be replaced to meet current code requirements. 1. 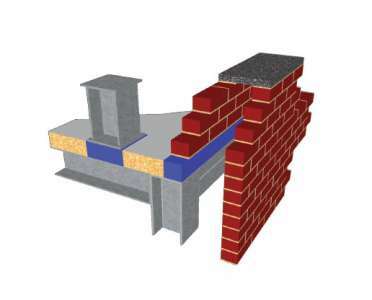 A Practical Guide to Cool Roofs and Cool Pavements (Imaginary Office, 2012), available to download at www.coolrooftoolkit.org/wp-content/pdfs/CoolRoofToolkit_Full.pdf. 2. “Awesome Interactive Map Shows How Hot Your City Will Be In 2100” by Leslie Baehr, published on July 9, 2014, on the Business Insider. Visit www.businessinsider.com/by-2100-this-is-how-hot-your-city-will-be-2014-7. 3. “It’s Getting Expensive to Ship NYC’s Garbage to Landfills” by Rich Calder for the New York Post, published on March 24, 2017, at nypost.com/2017/03/24/its-getting-expensive-to-ship-nycs-garbage-to-landfills. 4. “Old Buildings Are U.S. Cities’ Biggest Sustainability Challenge” by Iain Campbell Koben Calhoun for the Harvard Business Review. Posted on May 8, 2017, at hbr.org/2016/01/old-buildings-are-u-s-cities-biggest-sustainability-challenge. 5. Resources – Home & Building Owners Cool Roof Rating Council by the Cool Roof Rating Council (CRRC). 6. “Reflectivity, Emissivity Important Factors When Selecting A Cool Roof – Facilities Management Insights” by John A. D’Annunzio for Facilitiesnet, published on April 13, 2010, at www.facilitiesnet.com/roofing/article/Reflectivity-Emissivity-Important-Factors-When-Selecting-A-Cool-Roof-Facilities-Management-Roofing-Feature–11641. 7. “Learn About Heat Islands” at www.epa.gov/heat-islands/learn-about-heat-islands. 8. Brad Plumer’s “5 Ways to Keep Cities Cooler During Heat Waves,” published by The New York Times on July 24, 2018, and available at www.nytimes.com/2018/07/24/climate/heat-waves-cities.html. 9. “How 739 People Died in a Chicago Heat Wave” by Mike Thomas, published in the Chicago Magazine on June 29, 2015, and available at www.chicagomag.com/Chicago-Magazine/July-2015/1995-Chicago-heat-wave. Therefore, recoating with a highly reflective coating offers an affordable and feasible alternative to retrofitting an entire building or replacing the existing roof system. Highly reflective roof coatings can have a measurable impact on a building’s energy efficiency. Compared to traditional, dark roof material, reflective roof coatings can result in significant reductions in energy consumption, sometimes by 10 to 20 percent. Although energy cost savings may vary based on a number of factors (e.g. 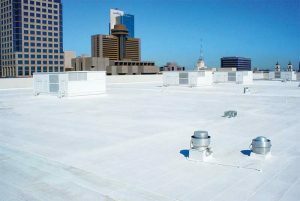 climate zone, utility rates, radiative properties of roofing products, insulation levels, and HVAC equipment efficiency), buildings that have been recoated with a white, reflective coating can save up to $0.36 per square meter. A reflective roof helps to lower a building’s heat load, thereby reducing the energy use of air-conditioning units. Reflectivity, emittance, and the solar reflectance index (SRI) are the metrics used to quantitatively evaluate and compare cool roofing performance. Solar reflectivity (SR) is measured on a scale of zero to one. This scale assesses the amount of solar energy being reflected by a surface. Zero indicates solar energy is not reflected, while one means 100 percent reflection. Solar emittance (SE) is also measured on a scale of zero to one. This measurement assesses how much absorbed heat radiates back into the atmosphere. Zero indicates the surface does not radiate any heat back into the atmosphere, while one means the surface radiates all heat back into the atmosphere. 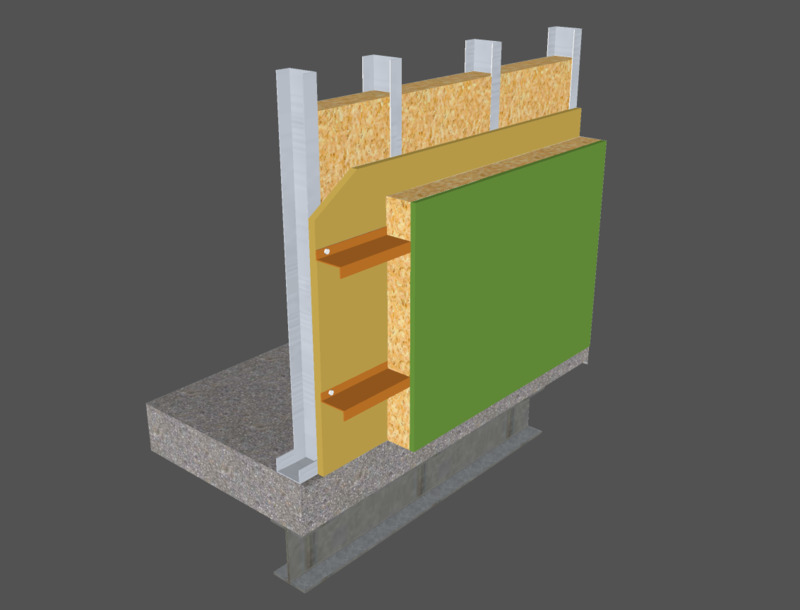 SRI is calculated by using both reflectance and emittance values as well as a convective coefficient to provide a measurement of relative steady-state surface temperature. SRI values are able to exceed 100.